With forecasters predicting heavy snowfall over the coming weeks, it is now more important than ever to get our four- legged friends ready. 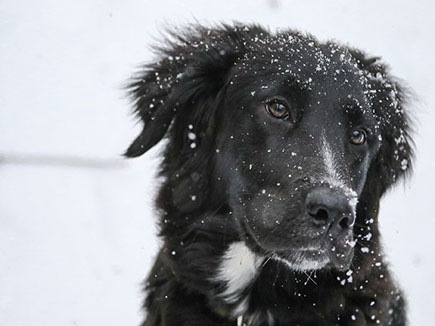 We have a few tips to keep your furry friends safe on those winter walkies. Invest in a suitable winter jacket, especially if your dog is short-haired, a smaller breed or old as they will need more help in preserving their body heat. Go for one that is waterproof but is also high-vis, to ensure that your dog can been seen on those dark wintry evening walks. Dog's paws can be protected using dog winter boots. They can help keep paws dry and less cold, although some dogs are not to fond of this idea. After a walk make sure to wipe down their feet, legs and stomach area with a towel. This is especially important as grit and antifreeze can cause irritation. Antifreeze is poisonous to pets if swallowed and can be fatal. Go for a lead that allows you to have more control. Avoid retractable ones as they provide less control. Be sure to check your dog’s leads, harnesses and collars regularly to ensure that they are safe to use. Wet conditions causes metal on these items to rust. Dogs can get overwhelmed by snow so it is best to keep them on the lead when it is snowing heavily. It is very important to make sure your dog is wearing a collar with an ID tag attached detailing your latest contact details. Update these details on the micro-chipping database too so that if your dog does get lost they can easily be retuned home. Pet owners, protect your little friends with our Pets Insurance! Call 0800 294 4522 to get a quick quote today!